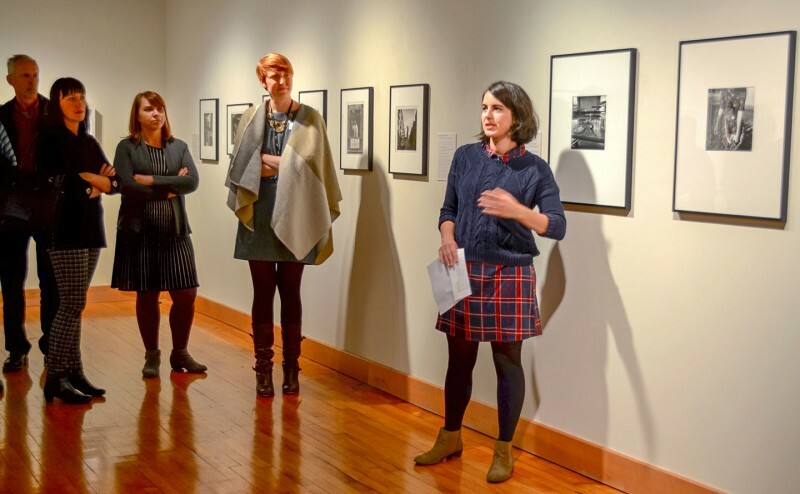 When Erin Fletcher pictures the future of Ohio Wesleyan University’s Richard M. Ross Art Museum, she sees an ever-increasing collaboration with faculty and students. An example of this partnership, said Fletcher, director of the museum, is inviting faculty to co-curate exhibits incorporating some of the 3,000 objects currently in the museum’s care. “These co-curated faculty exhibits are part of a new initiative to make our permanent teaching collection a resource for faculty and their classes,” Fletcher said. 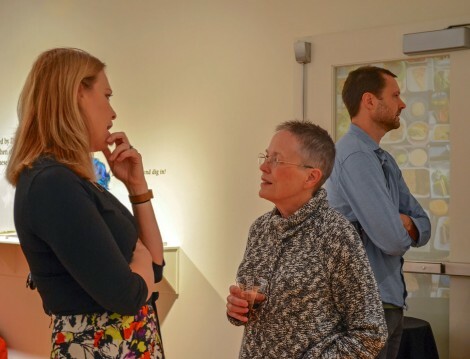 One recent collaboration is the “Culinary Roots/Migratory Routes” exhibit co-curated by Nancy Comorau, associate professor of English, and student assistant Anna Davies ’19 of St. Clairsville, Ohio. Their exhibit, on display through Dec. 13, is part of this year’s Sagan National Colloquium, an exploration of “Art and Engagement” directed by Fletcher. The exhibit also is inspired by Comorau’s “Reading the Global Kitchen” course. “Putting literature and art into conversation with one another allows each to illuminate the other, presenting new views and interpretations of the same phenomena,” Comorau said, noting that her students are writing about how the art connects with what they have read and learned in class. Comorau said using the Ross so strategically also contributes to the breadth and depth of an OWU liberal arts education. Davies, an English major, said she thinks students from many different academic disciplines will benefit from visiting the “Culinary Roots/Migratory” Routes exhibit. “I think English students can really benefit from the museum and how much time we spent strategically placing the works to ‘argue’ a definite thesis,” she said. “I also think students in UC 160 classes would benefit from seeing the innovative, museum-classroom hybrid work Erin Fletcher is doing at the Ross. Fletcher said having faculty and students curate exhibits is just one way for the Ross to showcase interdisciplinary learning. The museum staff is also happy to host visits or help professors develop singular assignments for classes. Franchesca Nestor, assistant professor of politics and government, and students in her “Equality and American Politics” class visited the museum recently for a workshop related to the “What We Make” exhibit, also part of this year’s Sagan National Colloquium. The exhibit was co-curated by Ashley Biser, associate professor of politics and government. Nestor said the display resonated with her class. “Some students who are quiet in the classroom came to life in this environment,” Nestor said. Upcoming collaborations at the Ross will include an exhibit by alumna JoAnn Verburg ’72 called “After/Before.” The fall 2019 exhibit will feature photography of landscapes containing disposable containers. “We are working with classes in the environmental studies major, environmental politics, biology, and photography to explore this exhibit through a lens of sustainability,” Fletcher said. Other ideas are in the works, and Fletcher invites faculty to come explore their ideas, too. “Art is a visual and conceptual way of exploring the world,” Fletcher said. “As such, it has huge potential to connect to a wide variety of disciplines. I am confident that we could develop exhibits relevant to almost any teaching department on campus. During the academic year, the Ross is open Tuesday, Wednesday, and Friday from 10 a.m. to 5 p.m.; Thursday from 10 a.m. to 9 p.m.; and Sunday from 1 p.m. to 5 p.m. The museum is handicap-accessible and admission is always free. Call (740) 368-3606 or visit www.owu.edu/ross for more information.